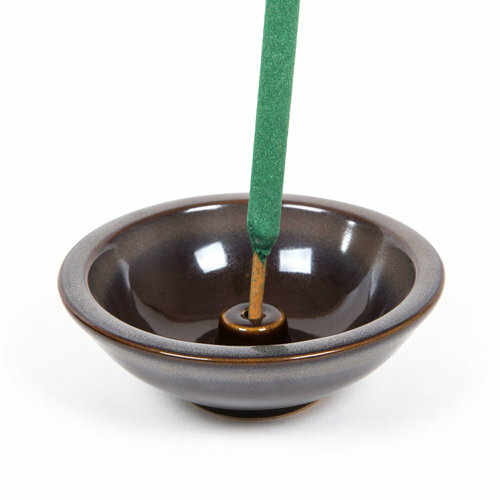 Don't forget your Ceramic Incense Stick Holder – made exclusively for holding/burning your Mosquito Repellent Incense Sticks! Murphy's Naturals Mosquito Repellent Incense Sticks are infused with Citronella, Rosemary, Peppermint, Lemongrass, and Cedarwood oils. We left out all the ingredients we don’t want, so you won’t find D.E.E.T. or petroleum in our incense sticks. Our sustainable formulation of these key plant based ingredients burns clean, naturally. To best repel mosquitoes, light Murphy's Mosquito Repellent Sticks on your patio or deck 10 minutes prior to your outdoor activity. USAGE TIP: Place several Murphy’s Mosquito Repellent Sticks around your area of use, spacing them 12 feet apart. Hold the Murphy's Mosquito Stick down at an angle and light the end until there is a flame (about 15 seconds). Allow end to flame for 10-20 seconds, then blow out. A wisp of natural incense repellent will come from the end of the stick and is ready for placement. 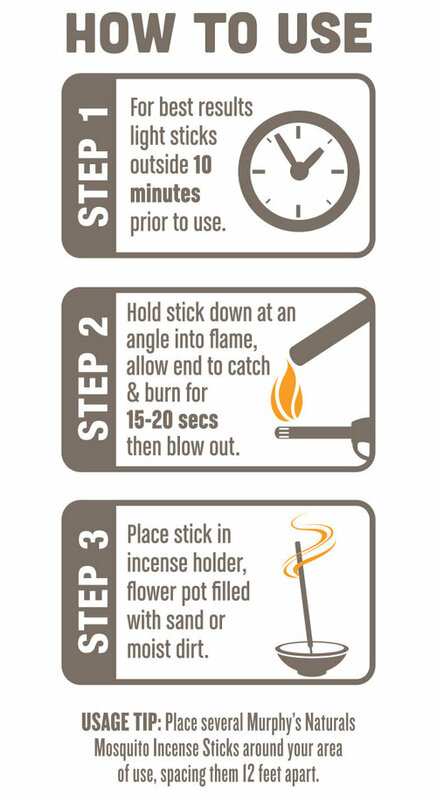 Place Murphy's Mosquito Repellent Sticks in a Ceramic Incense Stick Holder or a flower pot filled with moist sand/soil. Ensure the green incense does not touch things that may catch fire. The end of the burning incense stick and the ash is hot, see WARNING instructions. Never leave a burning incense stick unattended. Place stick so there is no danger of it lighting foliage or other things that catch fire. Do not let green incense touch things that may catch fire, do not stick incense stick into soil or sand beyond orange portion of incense stick. Keep children and pets away from the burning incense stick. This product has not been registered by the US Environmental Protection Agency. Murphy’s Naturals, Inc. represents that this product qualifies for exemption from registration under the Federal Insecticide, Fungicide, and Rodenticide Act.